Obtain a Utah Food Handler Permit from the Utah Department of Health. 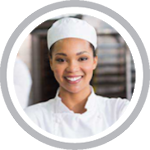 A Food Handler Training Course & Permit is required for all Utah food service employees that work in restaurants, cafes, bakeries, delis, mobile vendors, food trucks, bars, and convenience stores – such as chefs, cooks, servers, preparers, caterers and managers. (1) A food handler must have a valid food handler permit issued by a local health officer in the local health district where the food handler resides at the time the certificate is issued. The local health officer shall issue a food handler permit by mail or in person to a food handler that has a valid certificate indicating they have taken a course and passed an exam from an approved food handler training provider. The lowest price for Food Handler Training for the State of Utah! The course is ANSI-accredited, state-approved and will take you step-by-step through everything you need to know, including food safety definitions, safe hygienic practices, safe food temperatures, cross-contamination of food, and food-related illnesses. The Utah Food Handler online training course will teach you the basics of food safety principles, regulations, and techniques to maintain a food-safe environment in a Utah food establishment. This course will take you step-by-step through everything you need to know, including food safety definitions, safe hygienic practices, safe food temperatures, cross-contamination of food, and food-related illnesses. At the conclusion of the course, the learner will be tested on their knowledge of the learning objectives and content. You will be required to pass a comprehensive test and must pass with a 75% or better. Upon successfully passing the exam, the learner will be issued a Utah Food Handler Certificate of Completion – which is valid for 30 days. You will also be automatically registered with the Utah Health Department and will receive your Utah Food Handler Permit from the Utah Health Department by mail. The Utah Food Handler Permit issued is valid in Utah for 3 years. Audience: Chefs, cooks, mobile food vendors, bartenders, host/hostesses that handle food, bussers, caterers, wait staff,servers, supervisors and managers, food warehouse staff, and convenience store (c-store) clerks. At the conclusion of the course, the learner will be tested on their knowledge of the learning objectives and content. You will be required to pass a comprehensive test and must pass with a 75% or better. Upon successfully passing the exam, the learner will be issued a Utah Food Handler Certificate of Completion. Your Utah Food Handler Training Certificate of Completion will be valid for 30 days. Print this and keep it with you at work. To print your Certificate of Completion please go to the “My Courses” section of your profile, and from the “Show” drop-down list select “Completed Courses”. Once selected, please click on the “Print Certificate” icon in blue to print your Certificate of Completion. You will be automatically registered with the Utah Health Department and will receive your Utah Food Handler Permit from the Utah Health Department by mail. The Utah Food Handler Permit issued is valid in Utah for 3 years. Our Learn2Serve food handler training course program has been accredited by the American National Standards Institute (ANSI) in accordance with the standard set by American Society for Testing and Materials (ASTM). This national level certification for food handlers is valid in all 50 states. Gaining an accreditation from ANSI for the Food Handler Certificate Training Program means quality training that produces a food handler workforce more qualified than those without this Certification. Be a certified food handler. Take the ANSI-ASTM Food Handler Certificate Training Program today! We offer online Food Safety Training is approved by the Utah Department of Health and valid statewide for: Salt Lake City, West Valley City, Provo, West Jordan, Orem, Sandy, Ogden, St. George, Layton, Millcreek, Taylorsville, South Jordan, Lehi, Logan, Murray, Draper, Bear River, Central Utah, Davis County, Salt Lake County, Southeastern Utah, Southwest Utah, Summit County, Tooele County, Tri County, Utah County, Wasatch County, Weber/Morgan and many more! Getting your Utah Food Handlers Training couldn’t be easier!